Trinity Arts Center | Dance, music, theater, and art that look like praise. Music Recitals Are Coming Soon! Posted by Jamin Rathbun on 04/09/19. Trinity Arts Center's end-of-year music recitals are coming up. Check the schedule below (or the online calendar) for information on when your student's instructor(s) are hosting theirs. Looking forward to hearing the progress you've made! Trinity Arts Center Is Closed For Spring Break! Posted by Jamin Rathbun on 03/11/19. Don't forget, you can check our online calendar any time for info about upcoming events, holidays, etc. 4th Quarter Tuition Is Due By March 15th! 4th quarter tuition is due by Friday, March 15th. If you're registered to pay tuition by quarter, you'll get a reminder email today, with links to an invoice that you can pay online. Thanks for helping to keep things running smoothly by being on time. We really appreciate it! As always... shoot us an email or a Facebook message if you have questions. Even on Christmas break, we'll be pretty responsive to both. 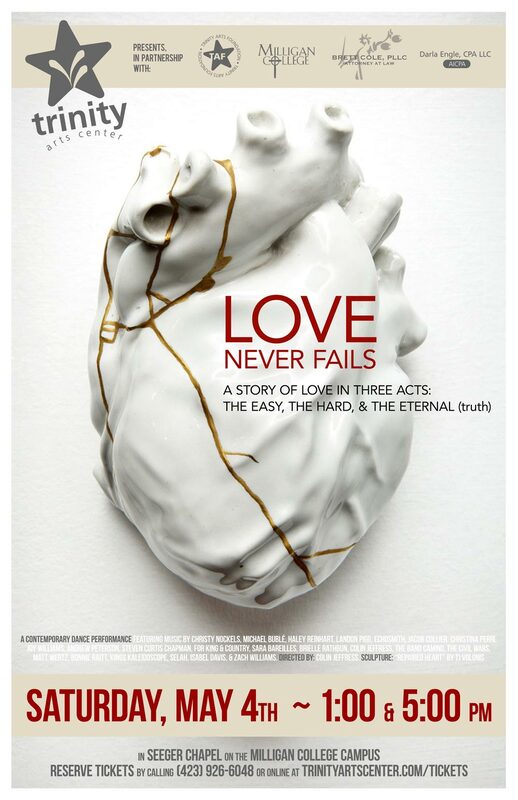 Tickets Are On Sale For "Love Never Fails!" Posted by Jamin Rathbun on 02/22/19. Purchase tickets for "Love Never Fails," our newest original contemporary dance production, which will be performed on Saturday, May 4th at 1:00 and 5:00 PM in Seeger Chapel on the Milligan College campus. For those who are new to Trinity, our spring dance production is one of two that we produce each year -- "God With Us" (our annual Christmas performance), and an original spring show. 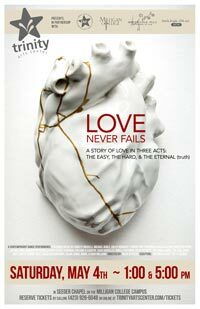 "Love Never Fails" is this year's spring production, featuring original choreography, set to contemporary, modern music. These shows aren't your typical ballet or recital. They are compelling, creative stories told through the art forms of dance and music. Regardless of your past experiences, we expect these performances to be something that almost anyone can enjoy and be moved by, and we'd love to see you there! Parents & Students: Visit the Parent Production Page for detailed information about rehearsals, tickets, cast info, costumes, and more. Posted by Jamin Rathbun on 01/11/18. In preparation for the 2019 summer dance program audition season, Eden Huhn has put together a helpful resource for dance parents and students, with information about programs, locations, and dates. Visit that page to review that info, and make your summer plans! Even if you're unsure about your readiness for summer dance programs (in skill level or financially), auditioning for summer programs is a great way to gain experience and confidence, and get good feedback from national dance instructors and program directors. We highly encourage our dancers to attend at least one each year. Don't forget, Trinity Arts Center's Summer Dance Intensive is the week of June 10th through the 14th this year and will be featuring Valery Lantratov (for an entire week this time) and our own Brielle Rathbun, plus some other surprises. We'll announce complete info about that in February, but save the date, and make plans to attend. Trinity Arts Center... Save The Dates! Posted by Jamin Rathbun on 01/11/19. Of course, we'll add more to the calendar as we move forward, but this gives you an idea what to expect for the rest of the 2018-19 school year. You can always reference our online calendar, message us on Facebook, email us, or call/text to (423) 926-6048. Registration For Princess Ballerina Camp Is Open! Registration for this year's Princess Ballerina Camp is open! From dance classes to tea parties and face painting to dress up, if you are a young girl (ages 3-8), Princess Ballerina Camp is the place to be this summer! As of Friday, February 22nd, we have 1 open spot in week one, and 29 for week two. We will likely be full by the end of March, so if you're interested, you need to act quickly. Princess Ballerina Camp is a half-day arts camp that introduces young girls to dance, art, music, grace, and manners in a playful, fun, and colorful way. Daily activites will include tea parties, costumes, dance classes, music instruction, art projects, face painting, and more -- all designed to give your princess a fun-filled week of instruction, friendship, and creativity. This year's camps will be held from Monday, June 17th to Friday, June 21st (Week 1) and from Monday, June 24th to Friday, June 28th (Week 2), from 9:00 to 12:00 each day, with a mid-morning snack and juice provided. To register, stop by the front desk at Trinity Arts Center or shoot us an email. Last year's camps filled up by the end of February, so please register early to guarantee your spot. The cost is $120 per week, and includes all materials. LOCAL DANCERS: Valery Lantratov, General Director of the Russian National Ballet Federation, will be teaching two ballet master classes on Saturday, January 19th from 10:00-11:30 (intermediate) and 11:30-1:00 (advanced). A graduate of the Moscow Academic Choreographic College, Lantratov was selected as a first soloist with the Moscow Stanislavski Ballet, dancing principal roles in ballets such as Don Quixote, Copellia, and Romeo & Juliet. Valery's credits include international performances with the Kremlin Ballet, and the Russian National Ballet Foundation, which he formed in 1993, being named "People s Artist of Russia" -- the Russian Federation's highest artistic honor. Mr. Lantratov holds a teaching certificate from Russia's National Academy of Theatrical Arts and is currently touring via the Russian National Ballet Foundation, introducing international audiences to some of the finest classical works of Russia. To see a video of Mr. Lantratov in action, watch this video on You Tube. The Intermediate class is for our Level 3 & 4 students (pre-pointe). The Advanced class is for our Level 5 & 6 (on pointe). Participation is just $25. Please take advantage of this very special opportunity to study from a true Russian Master. Email or call to register. Make Memories At Our 7th Annual Father/Daughter Dance! Posted by Jamin Rathbun on 12/07/18. Come create memories with your daughter(s) at Trinity Arts Center's 8th annual Father/Daughter dance! There are other Father/Daughter dances and events in town, but the energy and atmosphere of this event is unique. I promise, you and your daughters will remember these annual dates for a long time to come! Make your reservation fast, before tickets are sold out (they sell out every year). Our annual Father/Daughter Dance is an elegant night of dessert and dancing, with all proceeds going to fund scholarships at Trinity Arts Center. Come dance the night away with your daughters, friends, and fellow fathers. It will be a night to remember (it always is). Attire is formal (anything from slacks and a button-down to full-blown tux), as we'll spend the evening dancing under the lights at The Venue, in downtown Johnson City, on Saturday, February 16th from 6:00-9:00. Tickets are $20 each. Call or email early to reserve your place. We'll see you there! Make God With Us A Part Of Your Christmas Tradition! 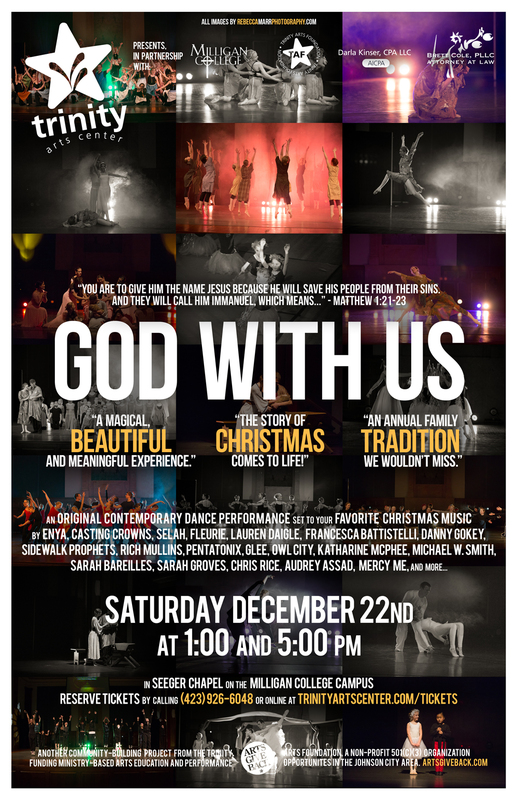 God With Us is an original, contemporary dance production that celebrates the birth of Jesus. With both contemporary and traditional Christmas music, and irresistably cute moments from our three and four year old dancers and meaningful moments from our most experienced ones, God With Us will entertain and inspire people of all ages. It's a beautiful way to remind yourself of the true meaning of Christmas. We'll Be Closed For Christmas From 12/23-01/06! Trinity Arts Center will be closed for a two-week Christmas Break from Sunday, December 23rd through Sunday, January 6th, reopening on Monday, January 7th. While we're talking about Christmas, we may as well mention our our snow policy as well. Since the roads are often clear by the time we start afternoon classes, we do not follow the closing schedule of any local school system. In case of bad road conditions, we will make a decision by noon of the day in question, posting an update to our web site and Facebook, and sending an email to let you know. Quarter & Semester Tuition Is Due On January 4th! Posted by Jamin Rathbun on 12/17/18. Quarter and Semester tuition is due on January 4th. If you're registered to pay tuition by quarter or semester, you'll get a reminder email today and again the week it is due. Thanks for helping to keep things running smoothly by being on time. We really appreciate it! Facebook & PayPal Match $7 Million on #GivingTuesday! Posted by Jamin Rathbun on 11/26/18. On Tuesday, November 27th, Facebook & PayPal will match $7,000,000 in donations for #GivingTuesday. Make a donation, and double the size of your gift by giving through our Facebook fundraiser page. For those who aren't familiar, the Trinity Arts Foundation has awarded more than half a million in grants and scholarships since 2006 and we're hoping to make 2019 our biggest year ever. We operate with zero administrative costs, so 100% of donations go to support artists and educators who are doing creative, community-building work. Please make a donation on Tuesday, November 27th or at any time between now and December 31st. Thank you! Trinity Arts Center Is Closed The Week Of Thanksgiving! Posted by Jamin Rathbun on 11/14/18. Trinity Arts Center is closed the entire week of Thanksgiving. We are SO grateful for your ongoing patrongage and support, which has allowed us to continue doing what we do, moving into our fourteenth year. Thank you, thank you, thank you! Don't forget. You can check our online calendar for up-to-date information about our calendar, and can check trinityartscenter.com or our Facebook page for archived copies of everything that goes out via email. Tickets For God With Us Are On Sale! Posted by Jamin Rathbun on 10/15/18. Tickets for the 13th annual performance of God With Us, our original, full-length, contemporary dance production telling the story of Christmas, are on sale today! Make God With Us a part of your family's Christmas tradition and join us on Saturday, December 22nd at 1:00 or 5:00 in Seeger Chapel on the Milligan College campus. God With Us includes performances by all of the dance students at Trinity Arts Center, set to contemporary and traditional Christmas music. From irresistably cute moments from our three and four year old dancers, to meaningful moments from our most experienced ones, God With Us will entertain and inspire people of all ages. After twelve years, I still can't wait to see what our dancers will bring this year. It's a beautiful way to remind yourself of the true meaning of Christmas. Parents & Students: Visit the production page for complete information about casts, costumes, rehearsal times, performances, parent volunteers, and more. Trinity Arts Center Is Closed For Fall Break! Posted by Jamin Rathbun on 10/08/18. Trinity Arts Center is clsed this week for Fall Break. By the way... We always follow Johnson City Schools for the full-week holidays (although we take the entire week off for Thanksgiving), but we don't ever take the one-day holidays and we make our own decisions about snow. 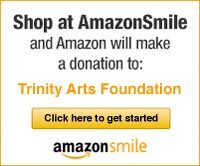 When in doubt, visit trinityartscenter.com, our online calendar or our Facebook page for up-to-date info. Quarterly Tuition Is Due This Friday! Quartly tuition is due this week. If you're registered to pay tuition by quarter (and haven't paid it yet), you should have received an email reminder this morning. Thanks for helping to keep things running smoothly by being on time. We really appreciate it! As always... shoot us an email or a Facebook message if you have questions. Even on fall break, we'll be pretty responsive to both. Tickets For Mary Poppins Are On Sale Now! Posted by Jamin Rathbun on 09/10/18. Annemarie Dugan and Steve Davis (the same directoral team that brought Annie, Fiddler on the Roof, The Sound of Music, and The Music Man to Johnson City) are at it again, bringing Mary Poppins -- one of the most beloved musicals of all time -- to the Gregory Center at Milligan College on November 9th through the 18th. Tickets went on sale Monday and will go very fast. Order yours today! Tickets are $20 each, and can be purchased at Trinity Arts Center, by phone (926-6048), or online at trinityartscenter.com/tickets. All seats are reserved. Posted by Jamin Rathbun on 09/14/18. On Tuesday, October 16th we will launch the first in a series of art workshops -- a six-week workshop called "Superhero Yourself" that will incorporate photography, drawing, anatomy, inking, and coloring as students conceptualize, design, and create a superhero version of themselves every Tuesday from 5:15-6:45 PM. This workshop is open to ages 10 and up and limited to just ten students to ensure lots of one-on-one attention. Although this playful format is intended to engage a broad group of students, don’t be fooled. This is a technique-packed workshop designed to give voice to a student's creativity and introduce them to several mediums. Tuition for this six week workshop is $85 and includes all materials. Email to hold your spot now. We're Open For Labor Day (And All One-Day Holidays)! Posted by Jamin Rathbun on 09/03/18. Trinity Arts Center is open on Labor Day (and all of the one-day holidays). We take a week off for fall break, a week for Thanksgiving, two weeks for Christmas, and one final week for spring break. Other than that, we're open, doing what we do. Our online calendar shows our scheduled holidays, performances, tuition deadlines, and more. Check that any time you have a doubt. See you soon! Fourth Friday Worship Nights At Trinity Arts Center! Posted by Jamin Rathbun on 08/21/18. On Friday, September 28th, we're kicking off a monthly worship gathering called "Fourth Friday Worship Nights at Trinity Arts Center." Join us from 7:00 to 9:00 PM (come and go as you please) to worship Jesus, confess sin, rest in God's goodness and mercy, read God's Word aloud, dance (if you're so inclined), and of course, to sing. I expect us to lean contemporary in style, but we have deep roots in hymns too, so there will definitely be something that everyone can call "their" song. Our worship band and singers will vary month to month, and will consist of Trinity faculty, students, and friends. If you'd like to get involved leading and serving (we need creative, talented people for setup, sound, environment, hospitality (coffee), prayer, poetry, reading, and more), let us know. Dance Clothing, Expectations, & Etiquette! Posted by Jamin Rathbun on 08/20/18. The beginning of a new school year is always a good time to highlight our standard dance clothing, point you in the direction of discountdance.com, and share a few thoughts about expectations and etiquette for our dance program. Our standard girl's dance uniform is light pink tights (fully footed, convertible, or ankle length), with a black leotard (long sleeve, cap sleeve, or spaghetti strap with minimal sequins), and simple, light pink ballet slippers. We standardize our classroom attire so that we can use them as a base for production costumes, and these uniforms are required. You're welcome to add a light pink or black skirt (although it's not required), but there are times that a teacher will ask you to remove it so they can see lines clearly. Boys wear black jazz pants with a white t-shirt and black ballet slippers. Target and Academy Sports stock smaller sizes of those items. If they don't have what you're looking for, discountdance.com is our go-to, and stocks everthing you could possible want. Plus, they give a 5-10% discount to you for entering our school code (#28758) and give us a 1% kick-back toward our costumes budget. Win, win. Jazz students wear a black leotard with black jazz pants and black jazz shoes. If you're confused about what any of those are, visit discountdance.com to see examples, and to get an idea what is available. Hip-hop students can wear whatever allows them to dance and feel cool. Generally speaking, that includes sweat pants, t-shirts, cool shoes, hats, and any accessories that add to the look without getting in the way. Be in class (or for little ones, in the lobby), in uniform, hair done, shoes on, on time, and ready to go. We have a large lobby and waiting area where you can get ready. Let's not waste class time waiting for late arrivals or unprepared dancers. We get it. Sometimes stuff happens, but -- do what you can to honor others' time and be in class and ready to go, on time. Check out our sample ballet bun videos if you need some help with those. Always be attentive and quiet in class. If you have a question, wait until an appropriate time, raise your hand, and wait for your teacher to call on you. The teacher is always right, even when they are wrong. I promise, we're trying hard to teach you everything we know in a loving and humble way, and some of us are old. Show us some grace when we make a mistake or forget. We'll figure it out eventually. Learning to show teachers (and elders) respect is part of what you're learning. If something does go wrong, it's probably Mr. Jamin's fault. If you have a complaint, comment, or question, send it here or shoot us a message on Facebook. We'll response asap. We do not allow parents to visit the classroom. It's just too disruptive, especially for the little ones (imagine trying to do what you do with two people sitting in chairs watching you the entire time). We produce two shows a year. You'll have lots of opportunities to see their progress. If you have questions about what we're doing in class, we're glad to schedule a quick meetup before or after class, or you can contact us at the front desk. Be humble, creative, patient, kind, encouraging, and work hard. Our motto is "art that looks like praise." We want to embody that in all that we do, and we hope you will too. Finally... Be yourself. We're not one of those studios that only accepts people who are a certain height, weight, or body type. You bring a love for dance and be willing to work, and we will give you the best training we can, and lots of opportunities to use that gift for good. Hopefully that helps set expectations and answers questions, especially for those who are new. As always, give us a shout if there's anything we can do. We're generally pretty responsive on Facebook as well. We Have Some Suggestions About Parking! Posted by Jamin Rathbun on 08/13/18. Although you guys have done an amazing job with parking and drop-off this year, we always like to remind our friends and patrons that parking on the street in front of Trinity Arts Center is illegal, and can result in a ticket. That's only happened once in thirteen years but still... I'd hate to have any of you be the second. Added to the mix this year, are some new neighbors next door (I'm working on getting them to stop parking in "our" pull through lane) and across the street (who have asked us not to park over there until after 5:00). It's an ongoing challenge as we continue to grow, but -- here is a parking map that we use for recitals and other high-traffic times that might make you aware of some options you hadn't considered, or didn't know were ours. As you know, we are working on a new facility, but until that day arrives, this is the best we've got. If you do park on the street, you do so at your own risk. These aren't high dollar tickets, but it's still frustrating to get one. We're sorry we don't have more convenint parking options right now. Thanks for your patience, and for being willing to walk a bit farther to keep us in good standing with the city and our neighbors. We really do appreciate it. While we're on the subject, maintaining the one-way traffic flow past the back building and out the other side really helps to reduce confusion and expedite the transition between classes. If you're early, and need to wait, please stay to the right, near the curb in front of the back studio so that the left lane remains free for other vehicles to make an exit. Keeping that left lane clear helps things run smoothly. Again, thanks. Click here to see that map. Posted by Jamin Rathbun on 08/06/18. School is back in session, and we have a 12,000 square foot facility with 10 music rooms, 4 dance studios, 1 dedicated art space, and a huge lobby/recital venue that is perfect for doing homework, or for parents and siblings to work, chat, play, or relax, with free wi-fi, books, toys, and homework help (if you don't mind a 50/50 chance of being wrong). We're working hard (and having fun) creating a vibrant, meaningful, encouraging community for creative people. Come join us! Although classes officially started this week, we're adding new students all the time. When you're ready, or when the dust settles from the beginning of the school year, take a peek at the schedule and let us know what we can do. Can't wait to see you! Posted by Jamin Rathbun on 08/02/18. Of course, we'll add a variety of guest artists, camps, and workshops to the schedule as well, which we'll announce as they are confirmed. You can always reference our online calendar, message us on Facebook, email us, or call/text to (423) 926-6048. Classes Begin In ONE Week! Posted by Jamin Rathbun on 07/30/18. Trinity classes begin in ONE WEEK! Whatever you're looking for, NOW is the time to schedule music, art, and dance classes for the 2018-19 school year. Stop by Tuesday or Thursday from from 4-6, shoot us an email, call, or Facebook message to hold your spot. Now is the time. The 2018-19 class schedule is online. Take a peek at that then let us know what we can do. Can't wait to see you! Mary Poppins Is Coming (Auditions Are 8/11 and 8/12)! Posted by Jamin Rathbun on 07/23/18. Auditions for Trinity Arts Center's November production of Mary Poppins will take place on Saturday, August 11th from 6:00-9:00 PM and Sunday, August 12th from 3:00-6:00 PM. Annemarie Dugan and Steve Davis (the same directorial team that brought us Annie, Fiddler on the Roof, The Sound of Music, and The Music Man) are at it again, bringing top-notch musical theater to Johnson City! You won't want to miss it! Save the date, for this enchanting family musical experience, full of unforgettable music and a handful of "wow" moments that the Johnson City theater scene has never seen! (we promise, you'll walk away smiling, laughing, and talking about what you saw). Performances will be held on November 9-11 and 16-18 in the Gregory Center on the Milligan College campus, with tickets going on sale Monday, September 10th. Download the audition information sheet for more information about what to expect and we'll see you on August 11th or 12th! Classes Begin In TWO Weeks! Trinity classes begin in TWO WEEKS! The schedule is filling fast, but we still have lots of open spots for music, art, and dance classes. Of course, the earlier you register, the more choices you'll have and the easier it will be to coordinate all of the pieces for school, arts, and sports. Stop by Tuesday or Thursday from from 4-6, shoot us an email, call, or Facebook message to hold your spot. Now is the time. 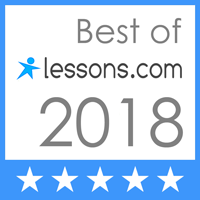 Johnson City's Favorite Studio (and Lessons.com's too)! Posted by Jamin Rathbun on 07/16/18. 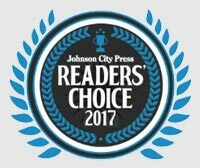 A few month's ago, Trinity Arts Center was voted Johnson City's favorite studio for the third year in a row (every year since we've been nominated). This week, we've been selected as one of a handful of five-star studios IN THE NATION by Lessons.com! We don't do what we do to win awards, but it is encouraging to be recognized for doing what we do. Thanks for continuing to let us do it since 2006! It truly is our pleasure! By the way... Classes for the 2018-19 school year start up on August 6th. 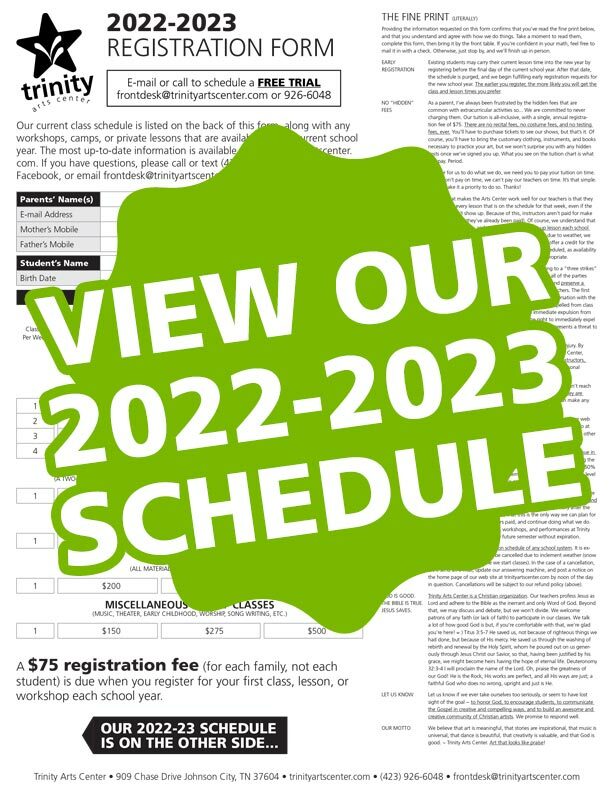 Now is the time to take a peek at the schedule and grab the class and lesson times you need for dance, music, and art. Let us know what we can do! Classes Begin In THREE Weeks! The 2018-19 class schedule is online. Take a peek at that then let us know what we can do. One way or another, we will see you soon! Classes For The 2018-19 School Year Begin In Four Weeks! Posted by Jamin Rathbun on 07/07/18. I know, I know... I'm not ready to think about "back to school" yet either but -- the truth of the matter is that now is the best time to get the class and lesson times you need for the new school year. Shoot us an email or stop by one of the early registration nights every Tuesday and Thursday from 4-6 so we can get spots held for you. Four weeks are going to fly by fast. The 2018-19 class schedule is online. Take a peek at that then let us know what we can do. One way or another, hopefully we will see you soon! Our New Art Classes Meet Twice A Week! Posted by Jamin Rathbun on 06/23/18. Our new twice-a-week art classes with Christopher Boyd are a great option for talented students with a high interest in and aptitude for creativity! We'll go way beyond arts and crafts, and give your kids an opportunity to experiment with a variety of mediums, develop technique, and use their creativity to grow, communicate, express themselves, solve problems, and create beauty. Chris is a next-level artist with a broad range of talents and training in drawing, painting, sculpting, pottery, and more. And not only is Chris a talented artist and teacher, he's an amazing encourager and role model who will build your kids up in more ways than just technique. Chris makes his living creating art, so he has great persepctive on how to apply creativity in a real-world, taking-care-of-a-family context. He's the real deal. If you have a creative kid, you'll want them to spend time with Chris. He's a big teddy bear, a creative juggernaut, and a creative rockstar. Classes for the 2018-19 school year begin on Monday, August 6th and the new art classes will meet on Tuesday and Thursday from 5:15-6:15 (ages 10-13) and 6:30-7:30 (ages 14-18). A complete class schedule is avialable online. Call or e-mail any time to get a spot held. Class size is limited to ten, so register early to guarantee a spot. Stop By Any Tuesday or Thursday in June or July! Posted by Jamin Rathbun on 06/19/18. In the meantime, take a peek at next year's class schedule, so you can see what's available. And of course, you can call, email, or send us a Facebook message to get your questions answered or spots held as well! Thanks! Classes Begin August 6th But Now Is The Time To Register! Posted by Jamin Rathbun on 06/13/18. For those who are already registered, confirmation invoices went out today. For those who haven't, you need to do that now! The schedule just gets fuller from here, and you risk missing out on the class and lesson times you need for the fall if you wait. Enter your name and email address to receive e-mail updates about classes, performances, workshops, and special events! Trinity Arts Center. Dance, music, theater, and art that looks like praise. © 2006-2018 Trinity Arts Center, Inc.